The Atlas B23-7 is a great model of a common locomotive, with good detail and a silky-smooth drive. 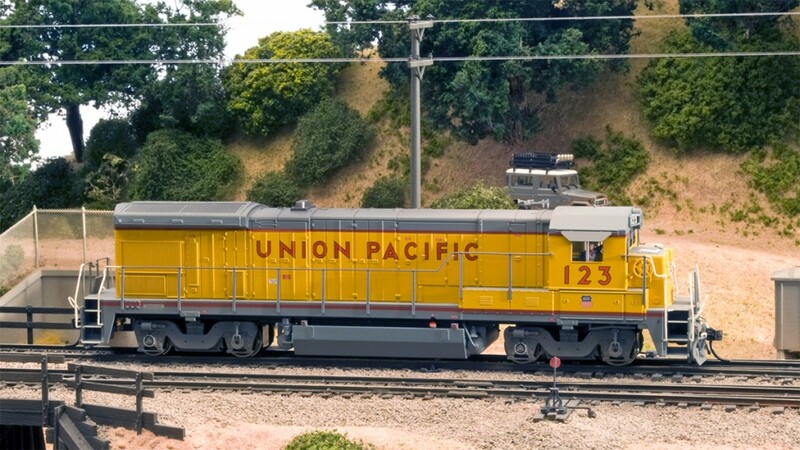 This locomotive comes equipped with a standard 8-pin DCC plug. Like many Atlas offerings, this one has a sound-ready frame. Mine was a factory-painted but unnumbered unit. I numbered it 123, somewhat tongue-in-cheek, using Microscale decals (though 123 is a valid number for this type of locomotive on the 1990s era UP). This didn’t really save me any effort, as the l, 2, and 3 had to be cut apart anyway to get the right spacing on the cab side. 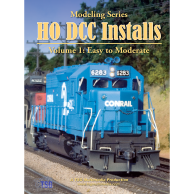 This is the only locomotive to appear twice on the HO DCC Installs Volume 1 DVD. The first time around, I use the 8-pin plug on the factory light board to do an easy non-sound install of a Digitrax DH163P decoder. I revisit the locomotive later and install a QSI revolution sound decoder and speaker using one of the factory speaker mounts. Only common CVs or those that were changed from their default values are listed. Some settings reflect my personal preferences for speed matching and performance. 1 (address) 123 123 counts as a 2-digit address since it is less than 128. 3 (acceleration) 34 This controls how quickly the locomotive changes speed when accelerating. 4 (deceleration) 28 This controls how quickly the locomotive changes speed when decelerating. 5 (top speed) 101 This controls the maximum voltage applied to the motor at full throttle. 6 (mid speed) 47 This controls the voltage applied to the motor at half throttle. 29 (configuration) 6 The setting of CV29 is complex. See your decoder instructions. Your DCC system may set CV29 for you when programming your locomotive’s address. If you need to modify CV29, it’s best to do it after setting the address. 55 (BEMF) 64 Digitrax calls this one “Static Compensation”. I used a moderate value here (range is up to 255). 56 (BEMF) 128 Digitrax calls this one “Dynamic Compensation”. I left this one at the default. 57 (BEMF) 119 This controls the BEMF intensity. 119 is 77 in hexadecimal, which for this variable means that the intensity in an advanced consist is 7 and the intensity for solo running is also 7. Only common CVs or those that were changed from their default values are listed. Some settings reflect my personal preferences for speed matching and performance. Note that some of the settings are very different from the Digitrax settings. CV values do not always translate between decoders. Bottom line, I used whatever values I needed to achieve the performance I was after. 1 (address) 123 123 counts as a 2-digit address since it is less than 128 (128 is FF, a two-digit number in hexadecimal). 2 (start speed) 34 This controls the minimum voltage applied to the motor at speed step 1. 4 (deceleration) 20 This controls how quickly the locomotive changes speed when decelerating. 5 (top speed) 161 This controls the maximum voltage applied to the motor at full throttle. 25 (speed curve) 2 This value produces a nice, predictable, linear speed curve. The speed curve controls how the throttle setting corresponds to locomotive speed. I find non-linear curves annoying, as it is hard to judge how much the train speed is going to change when I turn the throttle knob. 29 (configuration) 22 The setting of CV29 is complex. See your decoder instructions. Your DCC system may set CV29 for you when programming your locomotive’s address. If you need to modify CV29, it’s best to do it after setting the address. 51.0 (volume) 82 This is the overall sound volume. 52.16 (volume) 10 This is the air pump sound volume. 52.19 (volume) 11 This is the fan sound volume. 55.70.1 (lights) 90 I changed this to keep the front headlight bright when the locomotive is stopped but still “in forward”. By default it dims automatically. 55.73.1 (lights) 165 I changed this to keep the rear headlight bright when the locomotive is stopped but still “in reverse”. 56.0 (sound) 1 Turns the sound on when the locomotive is on a live track. By default the sound turns on only when the locomotive is selected. 56.5 (minimum BEMF) 1 Acts like a low speed floor to keep the locomotive from stalling at low speeds. I set this as low as possible, as I really don’t like the effect. 56.18.0 (BEMF) 30 Proportional gain for very low speeds. The low speed values are the most critical for smooth starts and stops. 56.18.2 (BEMF) 5 Differential gain for very low speeds. 56.19.0 (BEMF) 25 Proportional gain for low speeds. 56.19.2 (BEMF) 5 Differential gain for low speeds. 56.20.0 (BEMF) 20 Proportional gain for medium speeds. 56.20.2 (BEMF) 5 Differential gain for medium speeds. 56.21.0 (BEMF) 20 Proportional gain for high speeds. 56.21.2 (BEMF) 5 Differential gain for high speeds. I wanted the numberboards to light up with the front headlight, so I started off by removing the numberboard/headlight clear light pipe. Since it’s difficult at best to apply decals on bare plastic, I coated the numberboard surfaces with Polly Scale clear gloss acrylic paint and let it dry. Next, I used some plain white decal cut to size to cover the entire numberboard area. I applied the decals conventionally using Micro-Set and Micro-Sol to soften them and make them conform to the surface. Last, I used lightable numberboard decals from Microscale to apply the numbers. These are printed inverse: the number is clear and the background is black. The white shows through, and when lit the effect is just as good as the factory numberboards on a numbered model. I used a little black paint to fill in gaps between the decals, then coated the numberboard surfaces with more Polly Scale clear gloss to seal them. 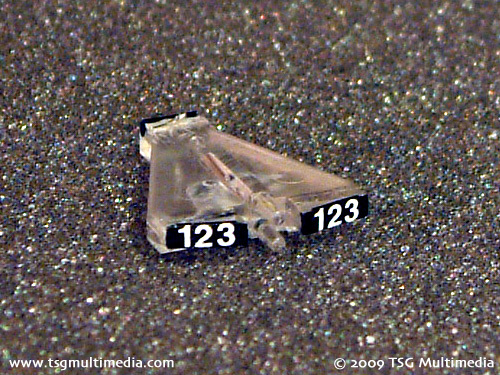 Looking at the Microscale online catalog, it looks like sheet 87-205 may have been updated with white instead of clear numbers. If so, you could probably skip the middle step. This technique also works for white numberboards with black numbers. I applied a little bit of detail to this model, mainly adding a firecracker antenna to the cab roof and adding a new air horn in the proper location for UP B23-7s. One thing about firecraker antennas – use a brass one. I used a plastic one on this model and though it hasn’t broken yet, I suspect it’s just a matter of time. I swapped the original plastic cab sunshades for new brass ones from A-line for the same reason, they last longer. Modern Atlas locomotives are among my favorites because they generally look good and are excellent, quiet runners. Prototype modelers who strive for accuracy may want to change a few small details like I did, but overall I would give Atlas very high marks. The DH163P is a good non-sound decoder, offering easy programmability, smooth performance and six lighting functions. 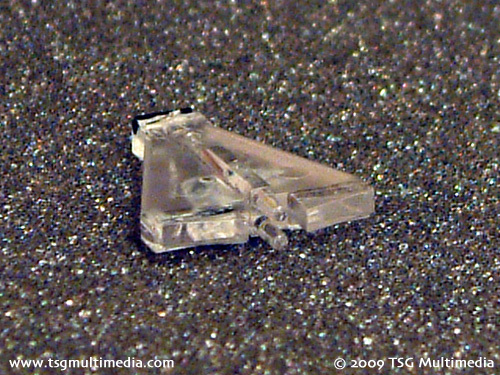 The harness is detachable, so that it can be used with either an 8-pin DCC plug or a JST connector. Several of the Digitrax DH163 decoders are in fact the same chip, and only differ with regard to the harness that is supplied with the decoder. This decoder also supports Digitrax transponding. In the past some Digitrax decoders have exhibited a strange “speed jump” problem, where the rate of acceleration or deceleration would surge at a specific place on the DCC throttle when BEMF was enabled. Thankfully I haven’t been able to make this locomotive do this, so maybe Digitrax has fixed this issue. The QSI revolution is very similar in performance to the factory-installed QSI decoders, so if you have some factory-equipped locomotives and want to equip them with a decoder that will program and perform the same way, the Revolution is a good choice. Sound quality is subjective, and no sound decoder is going to sound like a full-sized locomotive, but I think the QSI GE sounds are pretty good. Though I like these decoders overall, I find it hard to get a linear throttle response at very low speeds. The minimum BEMF CV creates the effect of having the locomotive start and crawl at a constant speed when my throttle is between 1 and 9 or 10 or so. Beyond that, it accelerates in a linear fashion. This is really only a problem when you mix brands of decoders and want to get your locomotives to play nice with one another. I don’t want to have any artificial restrictions on making up consists, so I strive to match the performance of every locomotive in my fleet as closely as possible. With tweaking I have been able to minimize but not completely eliminate this effect. Unfortunately turning off the minimum BEMF (setting CV 56.5 to 0) doesn’t work very well, either, as then the ability of the locomotive to sustain low speeds suffers greatly. My other complaint about the QSI Revolution is that the lighting outputs are not completely configurable without a computer and the QSI programmer hardware and software. 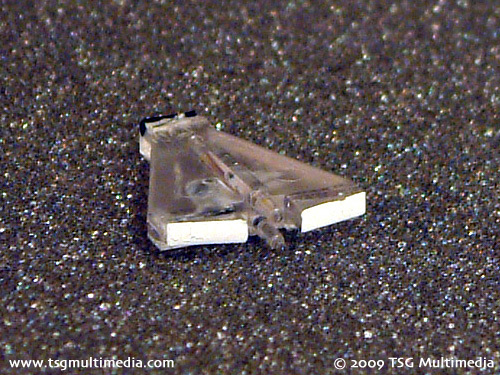 For example, F1 and F2 are preset as ditch lights. You can’t change them to work like a beacon or mars light just by programming CVs. This bothers me because I don’t think a computer and proprietary hardware should be required to fully utilize the decoder. In this case it didn’t matter since I modeled UP 123 as it would have appeared in the early 1990s, and it didn’t have any extra lights. Since this video was produced I swapped decoders again, this time to a LokSound Select. I really like the outstanding motor control that LokSound offers, and the sounds are first rate, too. LokSound decoders can be set up with a nice linear throttle response, and have excellent low-speed capability for silky smooth starts and stops. The six lighting outputs are also fully configurable with CVs. If you have a LokProgrammer, you can also change the sound set in the decoder.